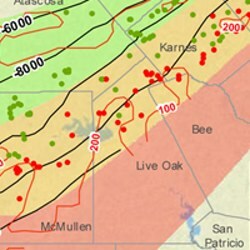 Live Oak County (1,079 sq miles), in South Texas, makes up part of the Eagle Ford Shale Play. Northern Live Oak County is prospective for the wet gas or gas condensate window of the the Eagle Ford Shale. The northwest portion of the county is the focus of oil activity. Well economics are supported by production that inlcudes higher valued condensate and NGLs. Much of the county is conducive to drilling for dry gas drilling, which activity will likely increase as natural gas prices warrant. County services of interest to oil and gas lease owners include the Live Oak County Appraisal District (tax collector) office and the Live Oak County Clerk (property records) office. The county seat is the town of George West. Other towns in Live Oak County include Choke Canyon Reservoir, Lebanon, Pernitas Point, Ray Point, and Three Rivers. Join the Live Oak County Discussion Group today - your voice counts! Burlington Resources (ConocoPhillips) and Pioneer are the two producers driving development of the Eagle Ford Shale in Live Oak County. ConocoPhillips is relatively quiet about its position, but considers the Eagle Ford core to its future growth potential. The company's target area covers almost 240,000 acre that extend into Live Oak County. Pioneer's Edwards Trend assets extend into Live Oak County and the company has shifted its resources to developing the Eagle Ford Shale after raising capital through a joint venture with Reliance Industries. Houston Pipe Line Company (Energy Transfer). Transcontinental Gas Pipeline Company (Williams).